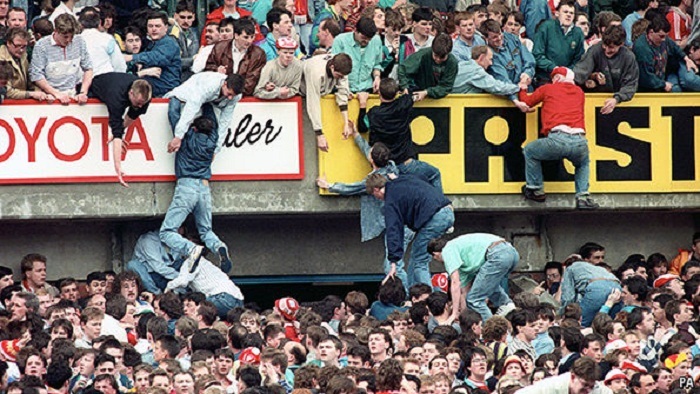 The police commander at the Hillsborough football stadium disaster appeared in court on Monday for the first day of his trial over the deaths of 95 Liverpool supporters, 30 years on from the tragedy. Duckenfield, 74, has pleaded not guilty to 95 counts of gross negligence manslaughter following the fatal crush in the Leppings Lane end. The trial is taking place at Preston Crown Court in northwest England. The city is 25 miles (40 kilometres) from Liverpool. Duckenfield sat next to co-defendant, former Sheffield Wednesday club secretary Graham Mackrell, who is charged with an offence involving the stadium safety certificate and a health and safety offence. The trial began with the whittling down of 100 potential jurors to the final panel of 12, with candidates asked if they supported any of the clubs involved or knew either of the men on trial. Families of the Hillsborough victims fought a long campaign for events surrounding the disaster to be re-investigated, and around a dozen family members were in court for the start of proceedings.